← Musicians and artists…I’d like to see you on Monday…MORNING! So there’s this program called Twitter. I get teased for using it, making connections, etc. However, it makes some fairly great things happen from time to time. 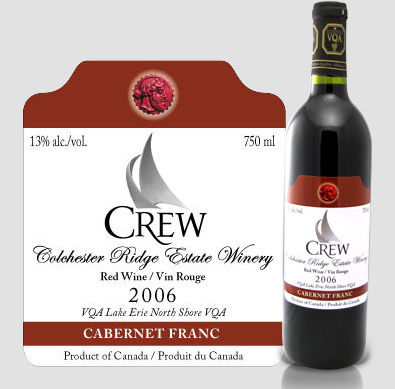 Known as “@Jiimmy” on Twitter, Jim is a sales representative for Colchester Ridge Estates Winery (CREW). I didn’t know this for several months. We were communicating on a local level, because we’re both people who care about the Windsor/Essex area. We use our blogs to promote good things in the area, and we use our community-cloud of contacts to share links, music, etc. with those who follow us on Twitter. That said, Jim decided to FINALLY tell me that he was a wine rep. and that he wanted to bring something by Phog for us to taste, and consider carrying in the bar. Being on a strong local kick lately, and having OTHER BUSINESSES knowing that local entrepreneurs are looking to support locals, we’re starting to get approached by these other deserving brands. Jim came in to meet Frank and I, to give us a list and tasting of delicious wines from CREW. That whole shebang means…it tastes good. The red has been selling like MAD. The white sells better when the weather is hot. I just figured it was about time I announced that we’re selling some new wine. It’s great. And you should come and try some. One of the amazing things I never knew about this winery is that they have a white wine (Riesling VQA 2007) that is the official white wine for the Legislative Assembly of Ontario! HELLO! This is the white wine option at Queen’s Park for any official dinner! Holy moly!! Come and support Colchester Ridge Estates Winery. This entry was posted in Uncategorized and tagged cafe, canada, Colchester Ridge state Winery, CREW, detroit, entertainment, events, indie, live music, lounge, ontario, phog, venue, windsor, wine. Bookmark the permalink. 1 Response to Colchester Ridge Estates Winery products at Phog Lounge? Yes. For realsies. Awesome, I look forward to trying both @ PHOG.We are trying to hook up with CREW to serve their Wine at this year'sArt Walkerville in July.Go Jimmy!